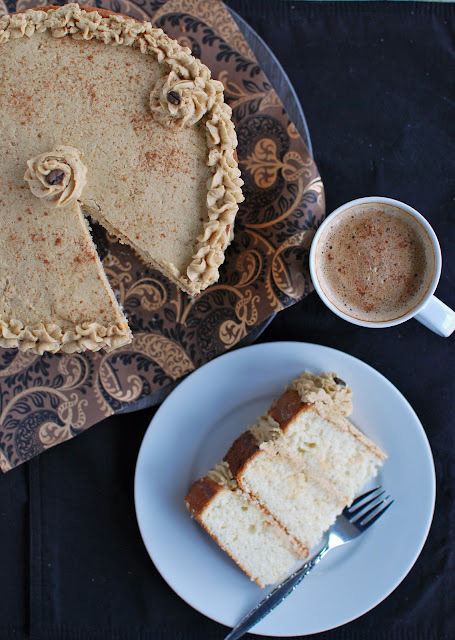 A homemade mocha torte introduced me to my first taste of coffee when I was still too young to drink it. Coffee and I continued our illicit affair in stolen bites of any dessert it graced - until we both felt we were ready and old enough to 'get serious'. With a lot of milk and sugar as a protective measure, I drank my first latte and never looked back. 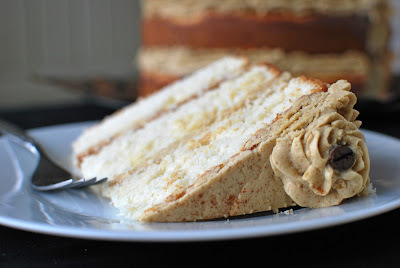 I still have a weakness for coffee-flavoured desserts and this triple-layer cake truly satisfies the craving: it takes all the flavours of a vanilla bean latte and translates them directly into dessert. Three, in this case, is not a crowd, but a definite crowd-pleaser: this cake, with its rich and flavourful three layers, made at least 20 people remember their 'first time'. Last week, a chef friend dealt me a few baggies of Madagascar vanilla beans and special Ceylon cinnamon (which has an almost floral or citrus-y scent) that he bought, with the caveat that he be able to try whatever I made. He said the cashier at the grocery store gave him a knowing look at the till when he bought a single box of Glad bags. Little did the cashier know, the future contents of those baggies would lead to something much more sense-awakening and habit-inducing than what he imagined - this cake, which clearly indulges two illicit habits of my own: dessert and coffee. For the cake layers, flour, sugar, butter and egg whites come together to provide multiple opportunities for flecks of vanilla bean to take sweet refuge in its soft-yet-dense crumb. Unless a pound cake or a curd is in your immediate future, I would recommend buying egg whites in a carton, as both the cake and the frosting require more than a dozen eggs' worth combined. Once the cake layers have cooled, they are frosted with a Swiss Meringue Buttercream frosting. 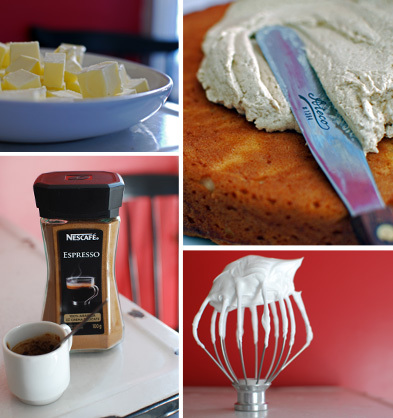 I loved the process of making this frosting, which somehow manages to be rich, yet light and buttery at the same time. The frothy frosting perfectly echoes the frothy milk on a latte for this coffee-flavoured cake. The process of bringing a Swiss Meringue Buttercream to life echoes that of bringing a woman to the next stage of a courtship: a bit of warmth, a buttering-up, and a lot of attention - which in this case happens on a double boiler (not a double bed). Egg whites are mixed with sugar and whisked constantly over the simmering water until the mixture reaches 160 degrees. The frothy mixture is then whipped with an electric beater until billowy and the bowl cools completely. Hungry for more, she then demands to be fed butter in bite-sized pieces at exactly the right temperature - 'softened, but cool' - letting each one incorporate fully before adding the next. The 'latte' elements are then added - a shot of vanilla followed by a shot of espresso to softly colour and boldly flavour the frosting. At this point she changes consistency, becoming silky and smooth, reminding you glossily of why you chose her in the first place. The frosting finds a home slathered lustily between each layer. This cake is a tall beauty; constructed rustically, leaving the sides provocatively exposed. Miette Bakery in San Fransisco coined the term "Tomboy Cake" for this method of simple exposed layers, and a prettily piped top. A garnish of coffee beans and a dusting of cinnamon provides a decorative reminder of the flavours in store. This is a cake whose vanilla-bean-speckled layers invited a sensuous coffee frosting between the sheets to 'meld flavours'. Enjoy! Cream the butter and sugar together until light and fluffy. Gradually add egg whites until fully incorporated. Sift dry ingredients into a bowl and add scrapings of vanilla bean and extract to buttermilk mixture. 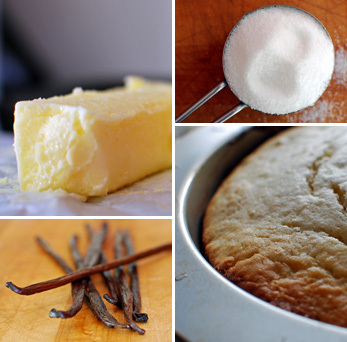 Alternate dry ingredients and buttermilk into creamed mixture, ending with dry ingredients. Mix gently until just incorporated. Butter and line the bottoms of three 8" cake pans with circles of parchment. Divide the batter evenly between all three pans. Bake in oven until lightly golden and a toothpick comes out clean - about 30 minutes, allowing for one rotation of the pans about half-way through. Let cool for 10 minutes before removing and allowing to cool completely on racks before frosting. Place the bowl of an electric mixer over a pot of simmering (not boiling) water. Add egg whites and sugar, whisking constantly until the mixture reaches 160 F on a candy thermometer and the sugar dissolves completely. Remove the bowl from the heat and re-attach to mixer stand. With the whisk attachment, whisk mixture until the bowl is cool to the touch and a billowy meringue has formed. Remove whisk attachment and replace with paddle attachment. Mix on medium speed and feed cubes of butter in, one at a time, until fully incorporated. Add flavourings and combine until smooth and silky. If mixture curdles, simply keep mixing, as it will come together eventually. If the mixture is too warm, place bowl in fridge for a while and then mix again until the right consistency. This frosting keeps well refrigerated in an airtight container for up to a week and in the freezer for 6-8 weeks, allowing to defrost overnight. To assemble the cake, place bottom layer on cake plate and spread with 1/3 of the frosting, going just to the edge of the flat surface. 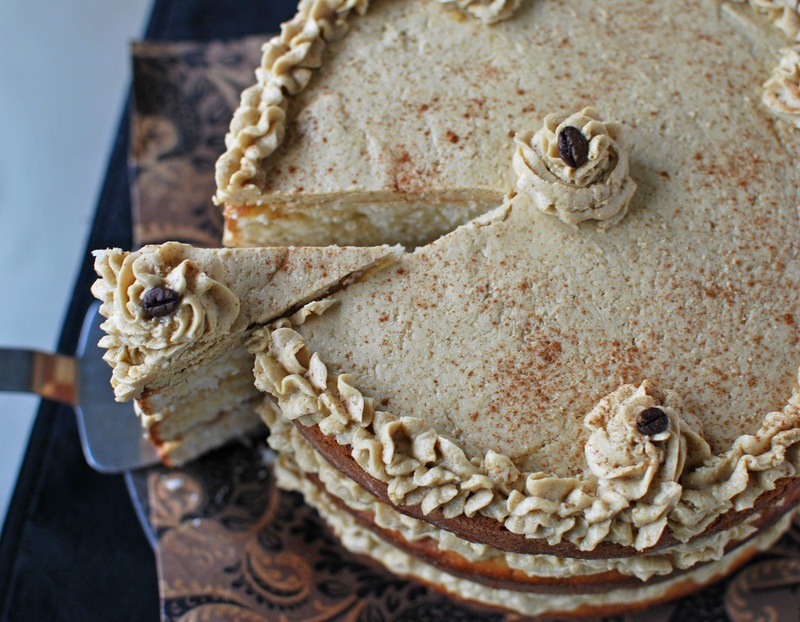 Repeat with the next two layers, decorating the top with coffee beans, vanilla pods, and a sprinkling of cinnamon, if you like. What a stunning cake. 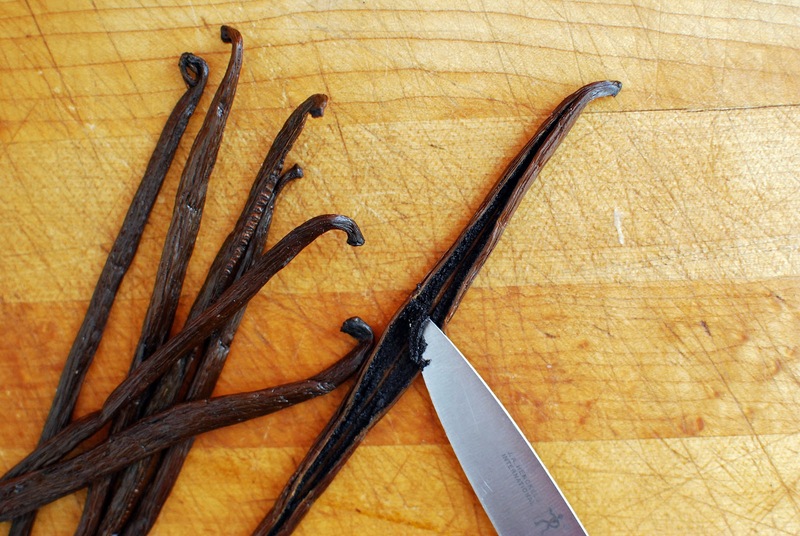 I love the look of it and the flavour of coffee, vanilla and cinnamon sounds wonderful. Thanks Caroline - wish you could come over and help me eat it! Oh, you gotta let me know how you piped the borders on top! I've not much experience in piping ;P I love how this cakes looks - I have the Miette cookbook and have been eyeing their rustic but elegant assembly a la tomboy cake! They have a YouTube video? Now, I got to check it out! Thanks for the tip! This cake looks absolutely delicious!! Yummmmmm! Congratulations - we love reading your blog and you most definately deserve it! Many thanks, Chloe and Sarah - I'm honoured!